I can finally relief the itch to blog that's been bugging me for the past one month . First off , the COOLEST thing that occured during Semester 2 . It was my first concert . So , i didn't know what to expect . BUT , i would say ... it was A-W-E-S-O-M-E ... 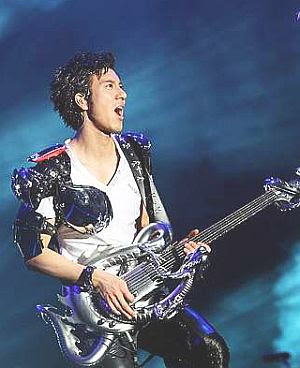 Awesome AWESOME-ness just oozes from LEE HOM . I managed to get myself the 3rd class tickets which cost RM268 ... ouch yeah ... but it was worth the money ... Though , i regretted not getting the first class tickets . Even with the 3rd class tickets , it is still impossible to see Mr.Awesome 's flawless figure and face . Yes , figure and face . According to my theory tells me that , one will not be good looking if he has brains , in other words , a person would never be totally perfect , one would have a good quality followed by a not so good one . For example : a guy having nice facial features will not necessarily have a nice figure to match with . And a guy with a nice figure , would not have the looks to go with . I have been wondering . HOW ?? HOW is it possible that Lee Hom has talent , looks , figure and brains all together . I'm not exaggerating . Back to the concert details , Marvel Comics was the theme of the concert . He came out introducing that he was Music man , not iron man , not superman , not spiderman . And at one point , the back ground screen displayed all the Marvel comic characters . SO COOL . The Music man had his super damn cool Dragon shaped Bahamut electric guitar as his weapon . Overall , the concert was better than what I expected . He sang his best hits . I particularly enjoyed his performance of " zu ling shen cu " . Music and lightings complemented the whole performance . Most of the songs he sang were ballads . Got me covered in goosebumps ... Lee hom's vocal performance during the concert was better than what he had on his CD . By the end of the concert ... I totally fell deeply in love with him . It was one week to my major exam then ... And i suffered from post- concert effects . Couldn't help thinking of him while studying :) .